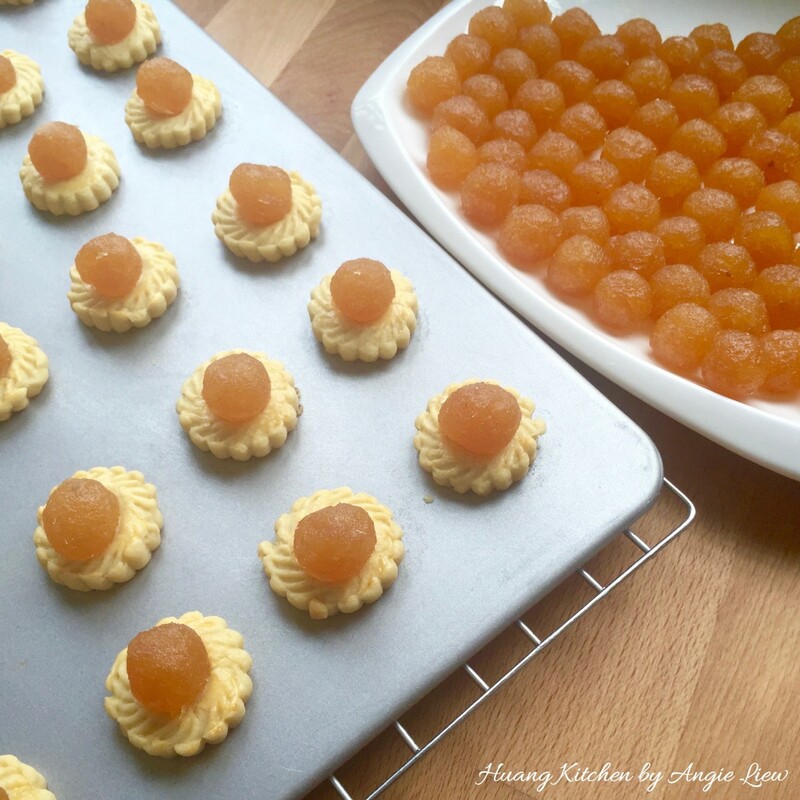 This is an open-faced pineapple tarts recipe. 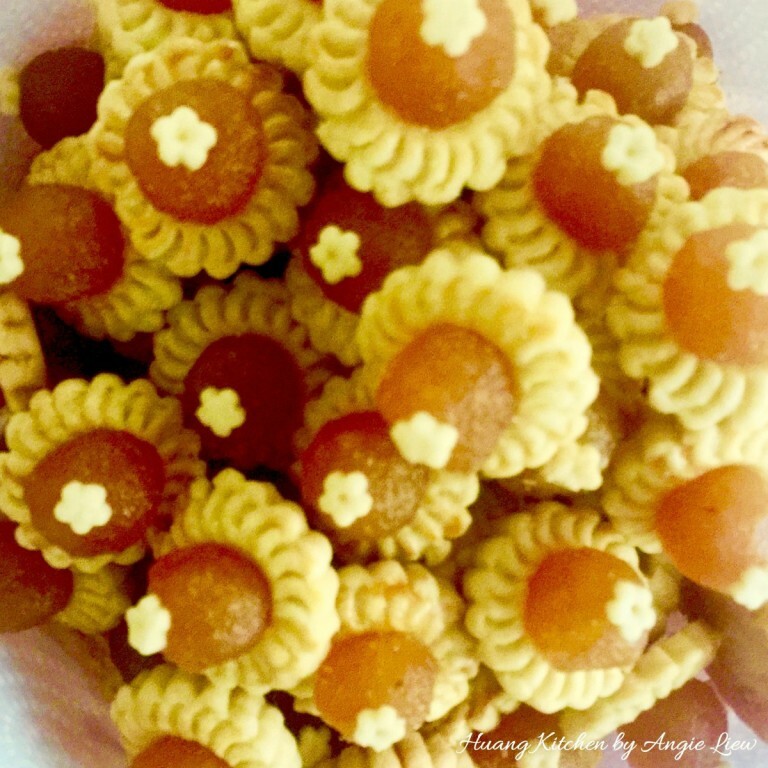 Pineapple tarts (黄梨塔) are small, bite-size pastries topped with pineapple jam. They are very popular during festive periods, be it Chinese New Year, Hari Raya, Deepavali or Christmas. They also make your high tea an extra special one. 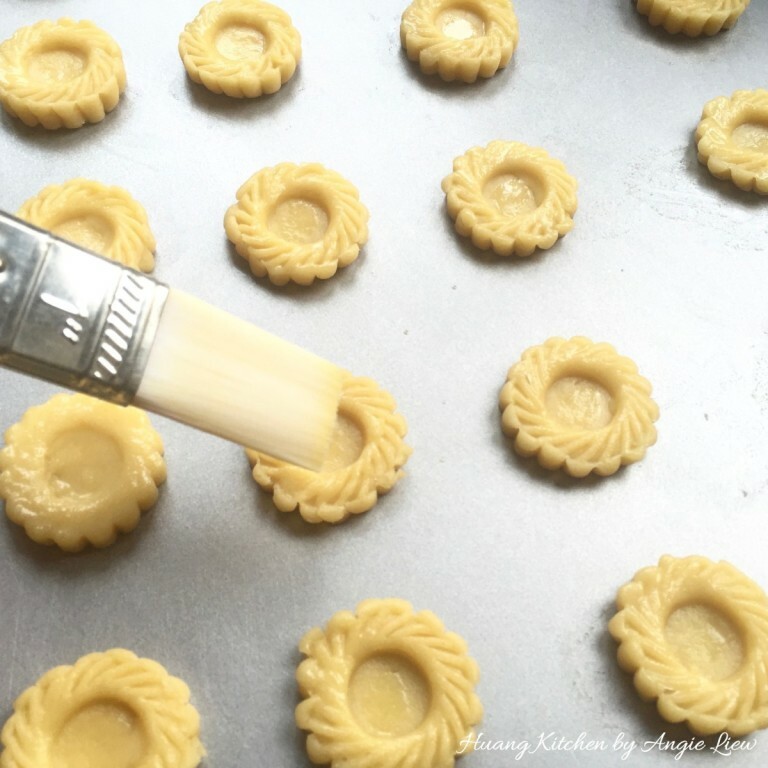 Making pineapple tarts may be laborious especially if you are making your own jam (See our recipe on How To Make Pineapple Jam). However when done well, they are well worth the effort as they taste so much better than those purchased commercially. 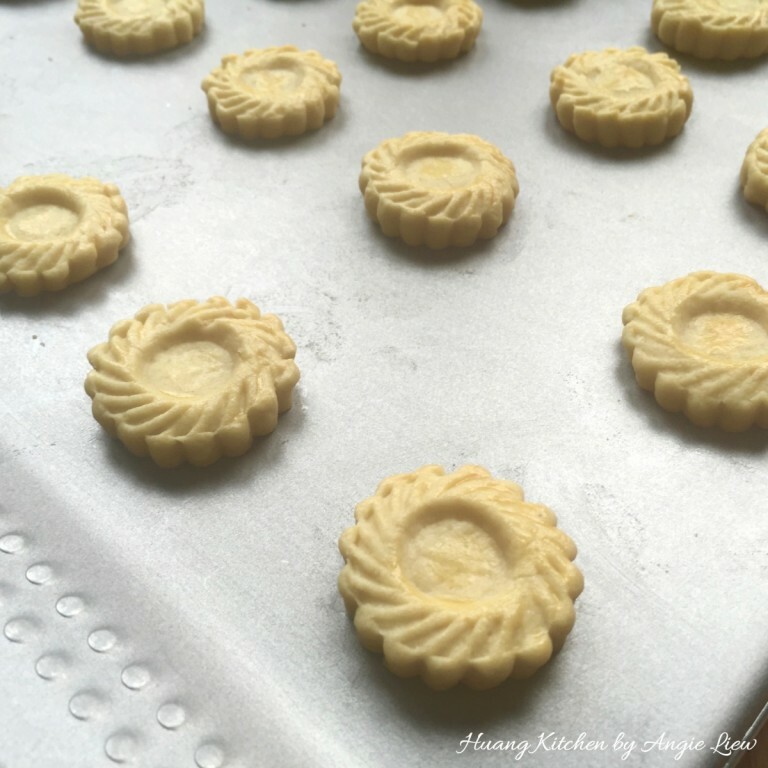 These homemade flower blossom pineapple tarts have a golden finish and look dainty and pretty, like a golden and cherry sunflower. 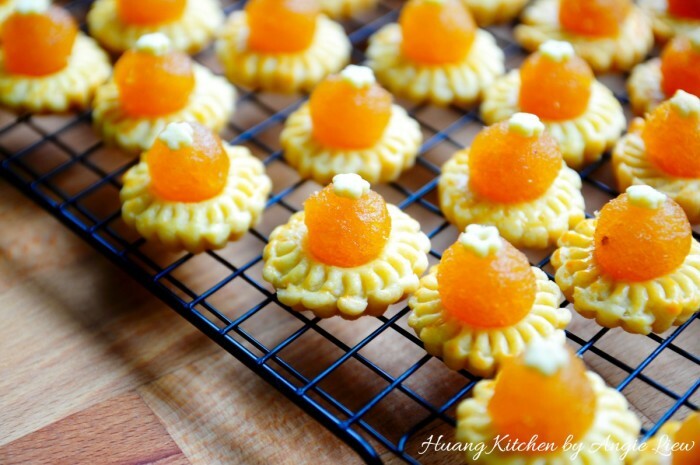 The tart pastry is extremely crumbly and buttery, they make the perfect melt-in-the-mouth pineapple tarts. 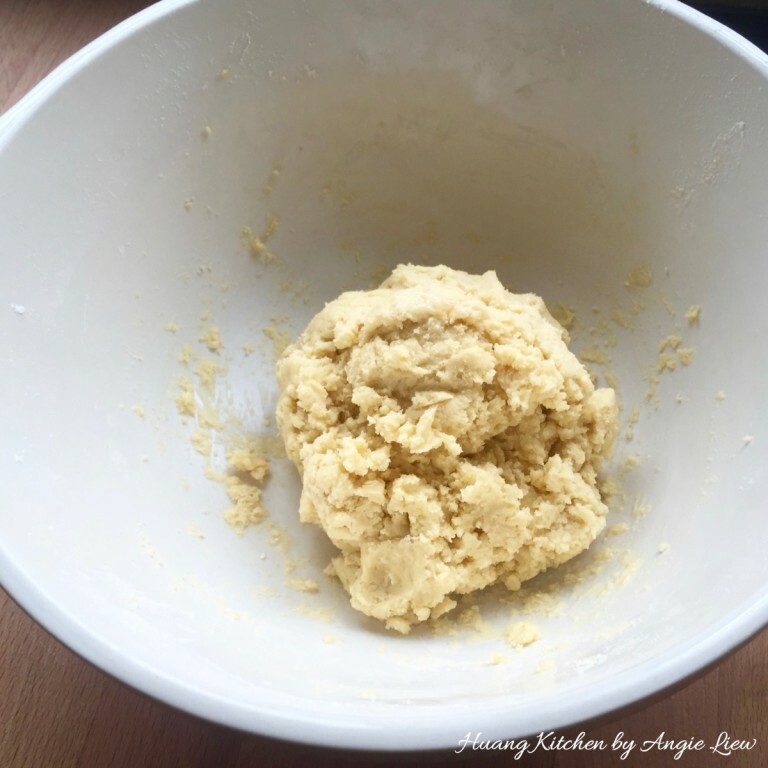 So, for those who love buttery pineapple tarts that has the melt-in-the-mouth effect, THIS is the recipe for you. Want to make your very own pineapple jam for these delicious tarts? 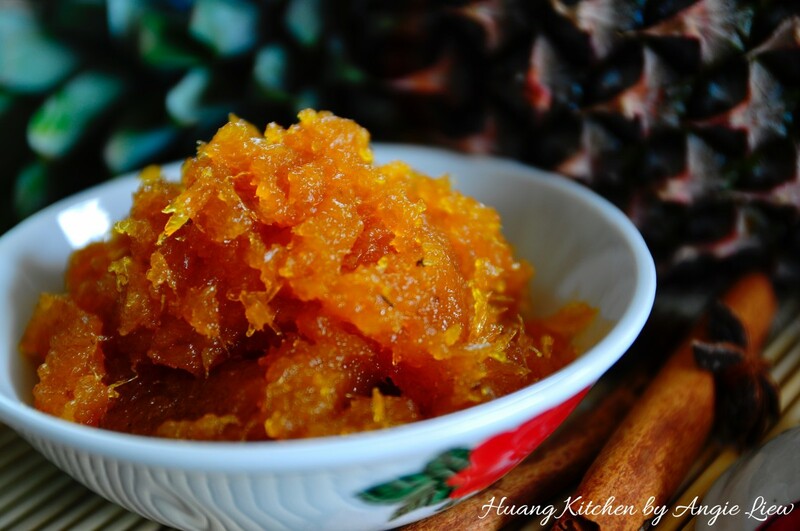 See our recipe on How To Make Pineapple Jam! 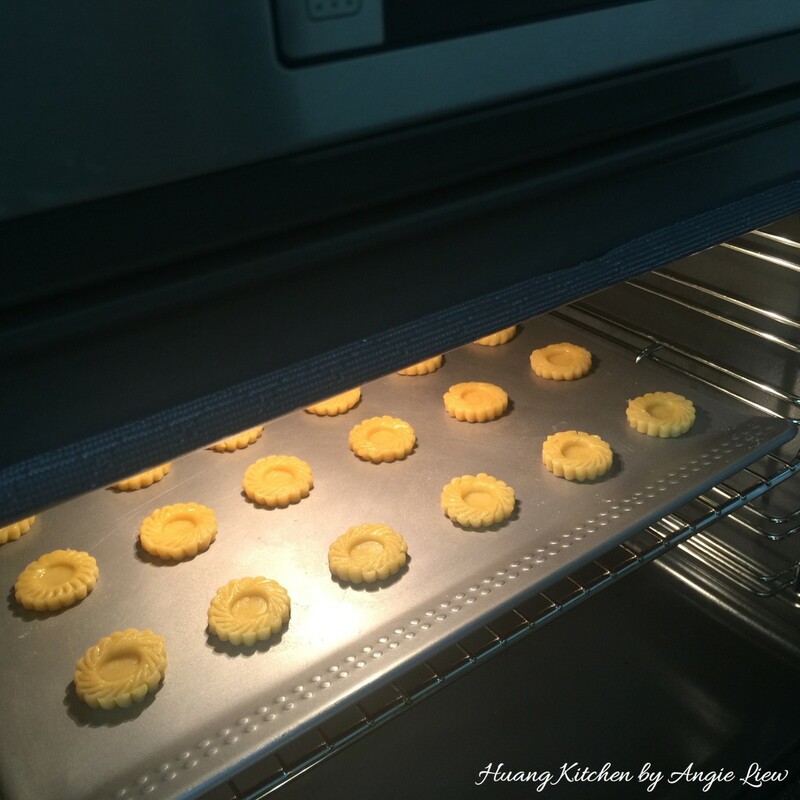 Making pineapple tarts with homemade pineapple jam instead of store-bought jam is really worth the extra effort, as the homemade jam is filled with fragrance of fresh pineapples and incredible aroma of spices. 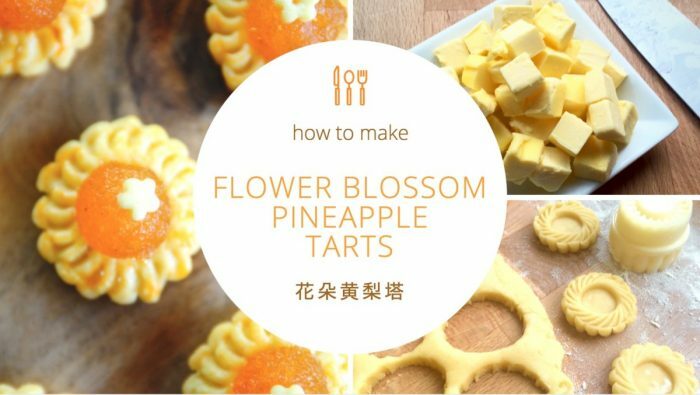 We also have an earlier recipe on How To Make Rose Pineapple Tarts, a rose-shaped variation of the traditional pineapple tarts. 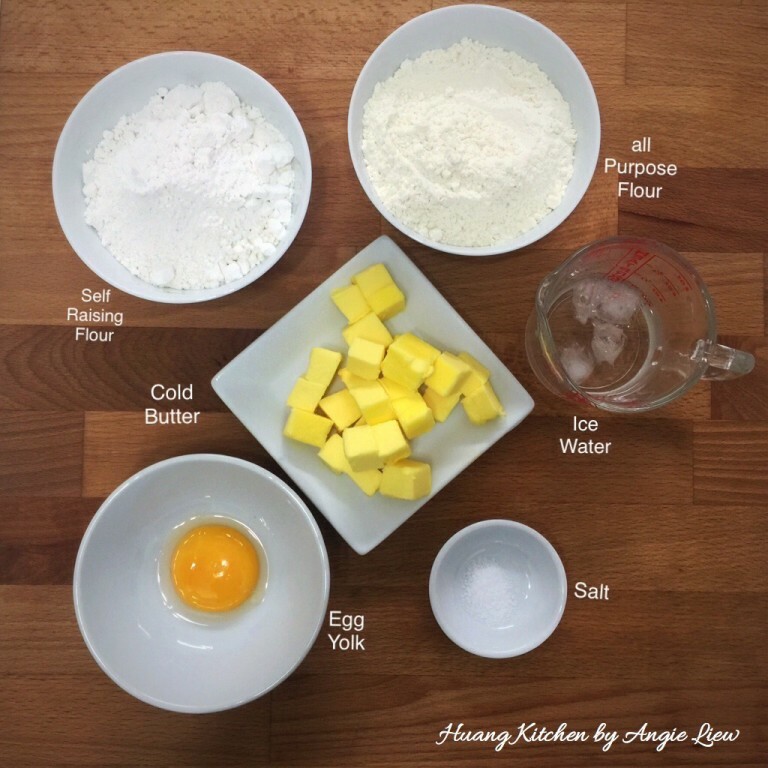 This is a recipe for open-faced pineapple tarts. 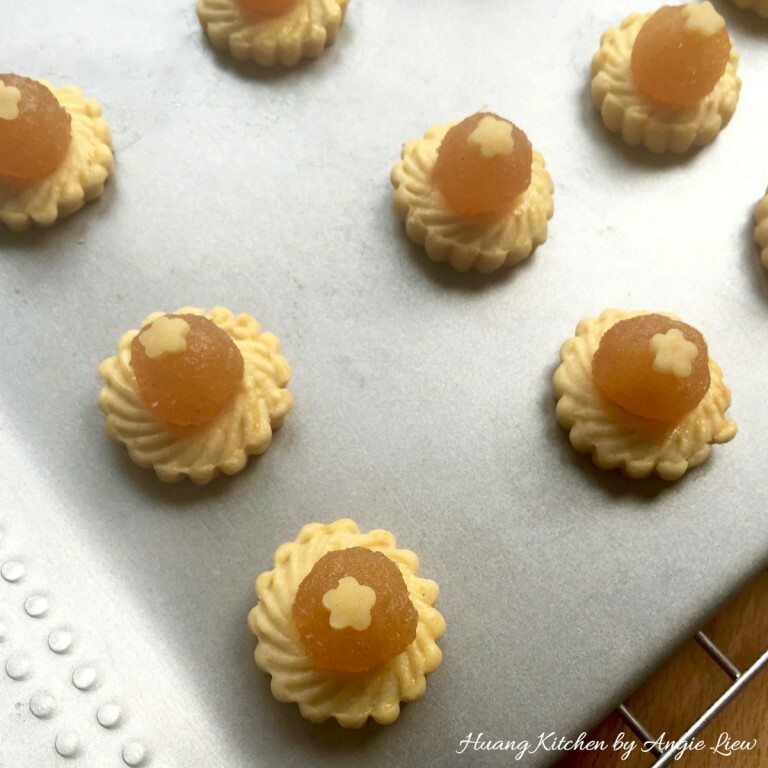 These homemade flower blossom pineapple tarts have a golden finish and look dainty and pretty, like a golden and cherry sunflower. 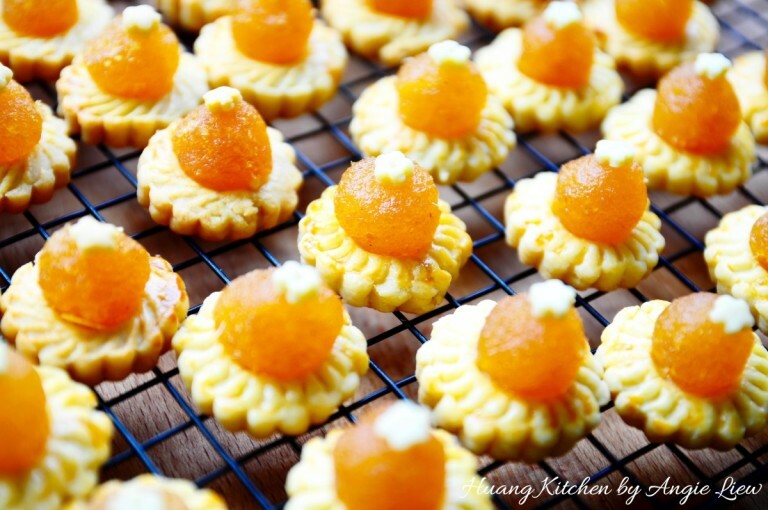 The tart pastry is extremely crumbly and buttery, they make the perfect melt-in-the-mouth pineapple tarts. Have ready all ingredients to make the pastry dough for the pineapple tarts. Also have ready some homemade or store-bought pineapple jam. For open-faced pineapple tarts, the pineapple jam can be slightly moist as it will continue to dry out when baked. Roll the pineapple filling/paste into balls, about 5 gram each. This can be done ahead of time and set aside until needed. To do this, have a wet cloth nearby so you can wet your hands slightly to prevent the pineapple paste from sticking to your hands when you shape them. 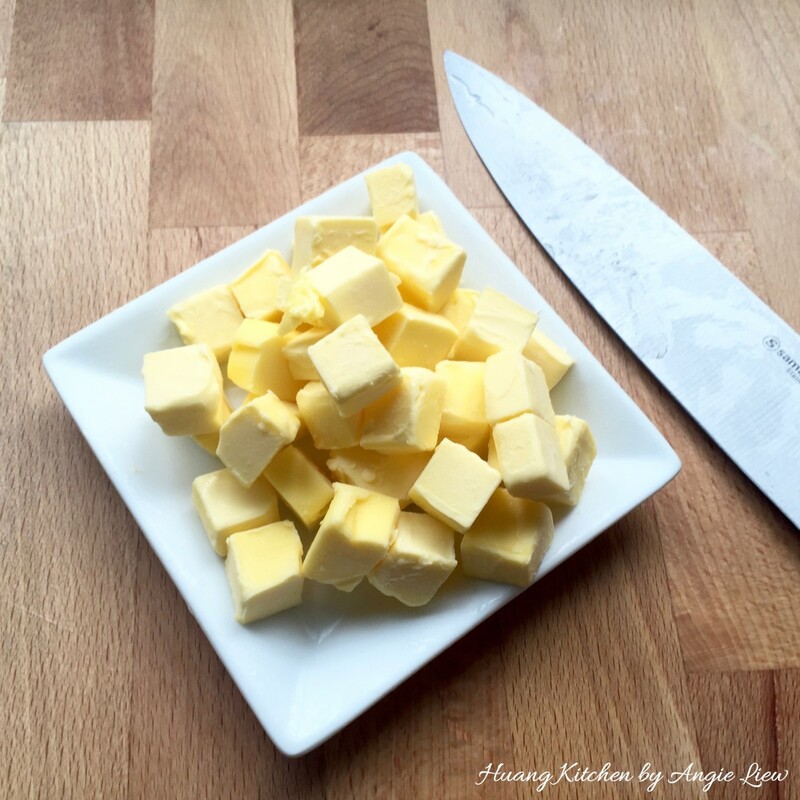 Cut cold butter straight from the refrigerator into cubes and leave to chill in the refrigerator until ready to be used. 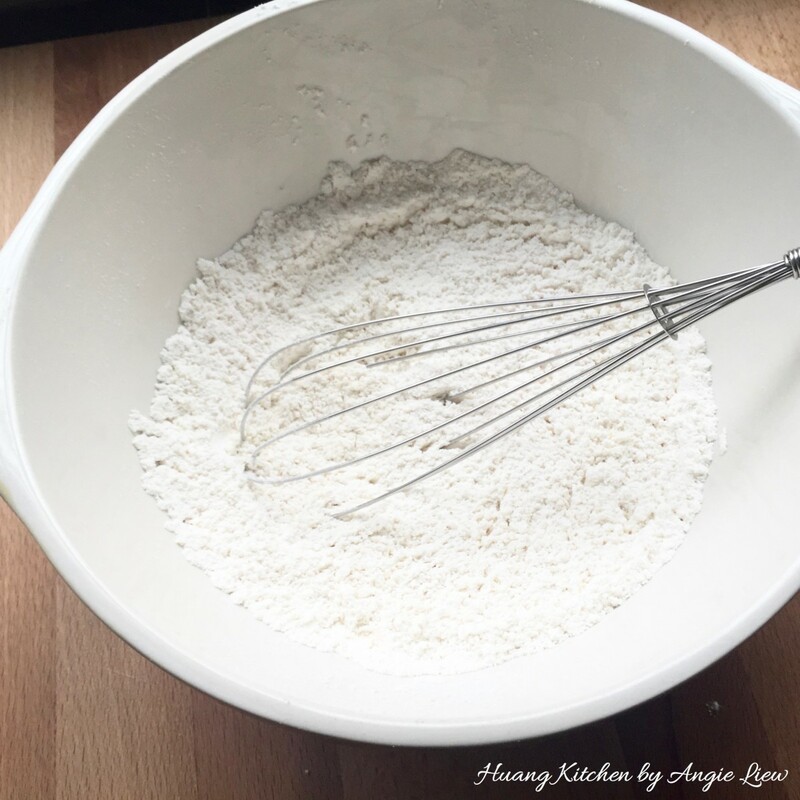 To make the crust pastry, first sift all-purpose flour, self raising flour and salt into a large mixing bowl. 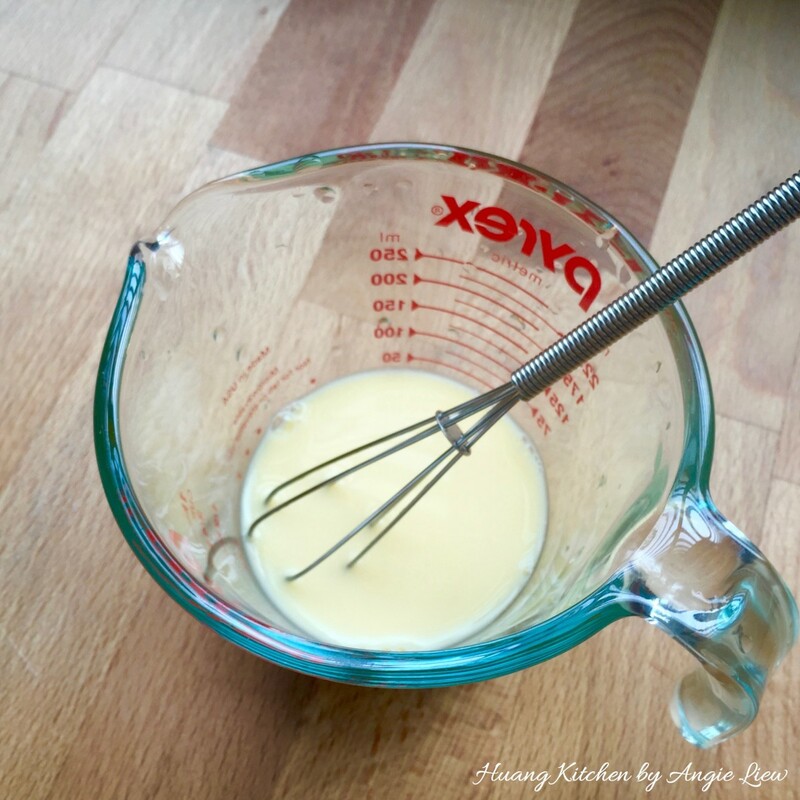 Using a whisk, mix everything together. Add in COLD diced butter cubes. 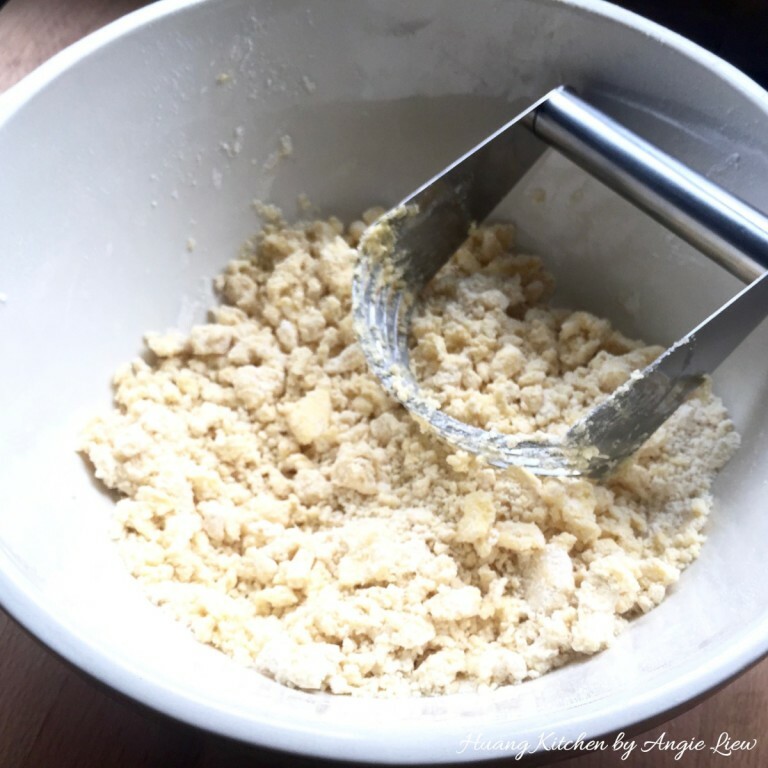 Using a pastry cutter, cut the cold butter into the flour mixture until mixture resembles fine bread crumbs. 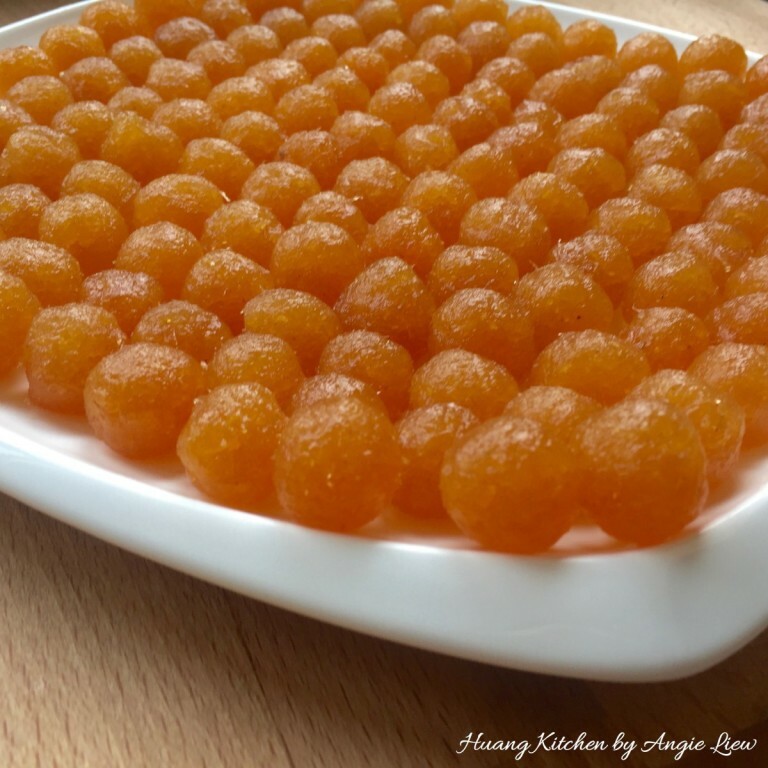 This is to create flaky layers in the pineapple tarts. Meanwhile, mix together the egg yolk and ice cold water. 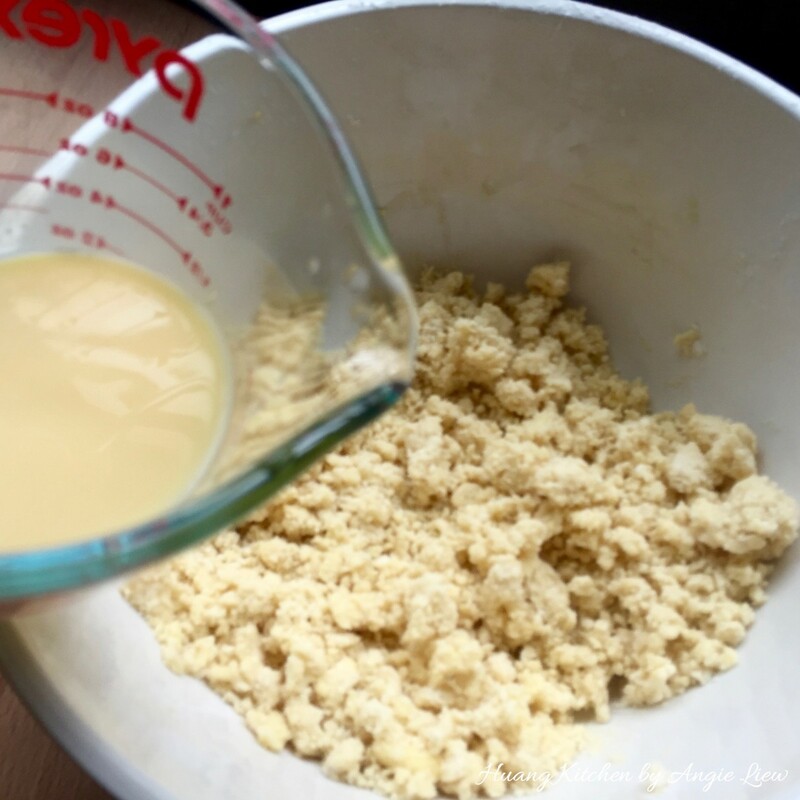 Add the combined egg yolk and cold water into the coarse crumb flour mixture. 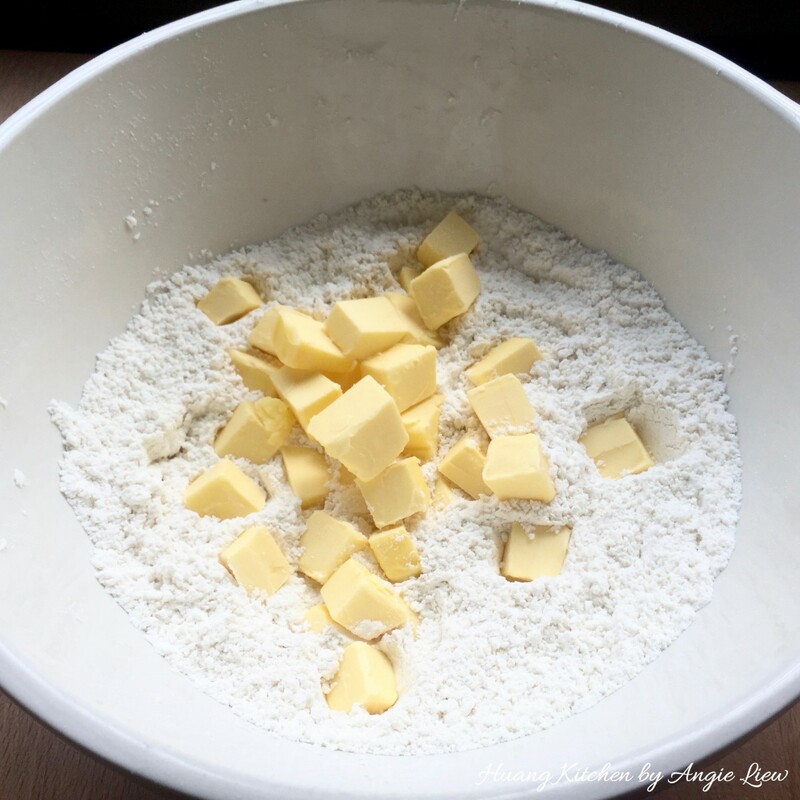 Lightly gather to form a soft dough. 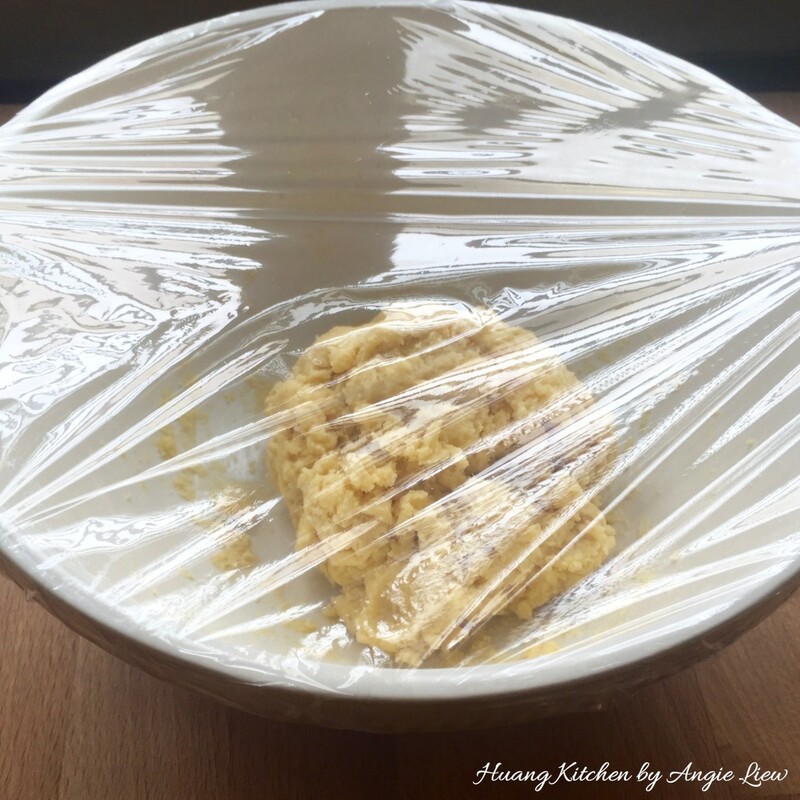 Cover with cling wrap and chill in the refrigerator for 30 minutes to firm up the dough. 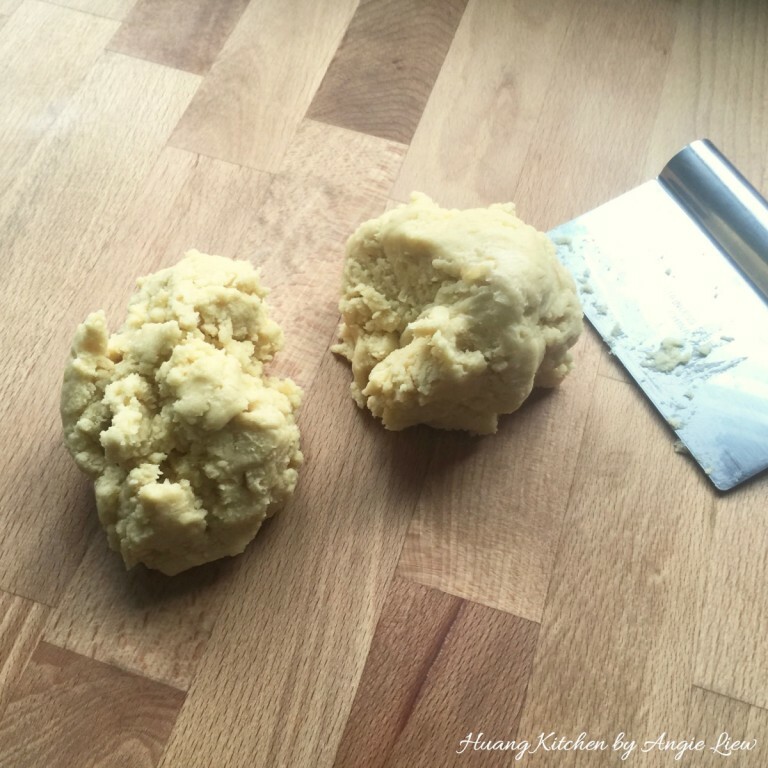 Divide the chilled dough in halves for better handling. Work on one half first and leave the other half chilled in refrigerator. 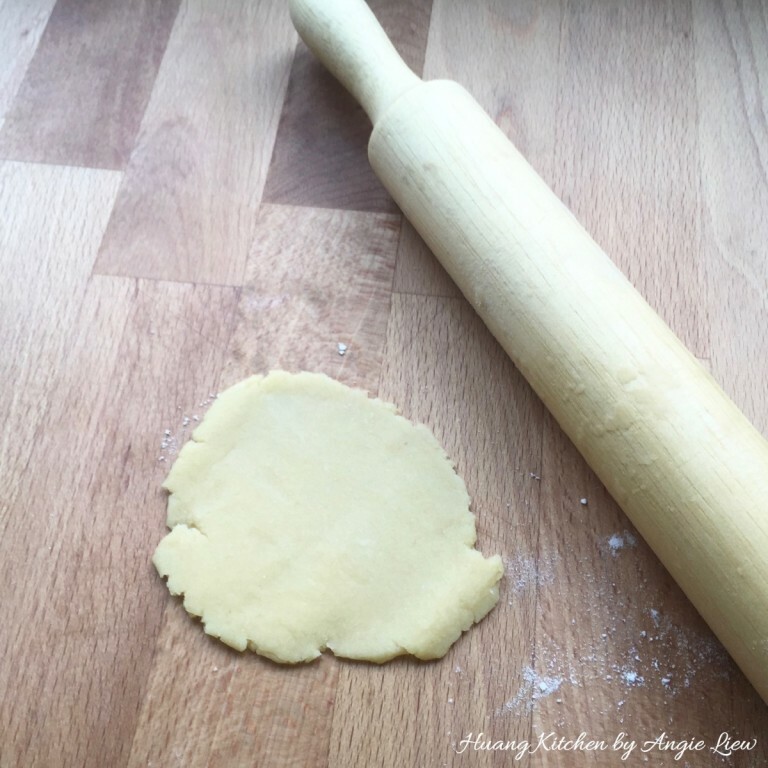 Using a rolling pin, roll the chilled pastry dough into 0.5cm thick on a lightly floured board. 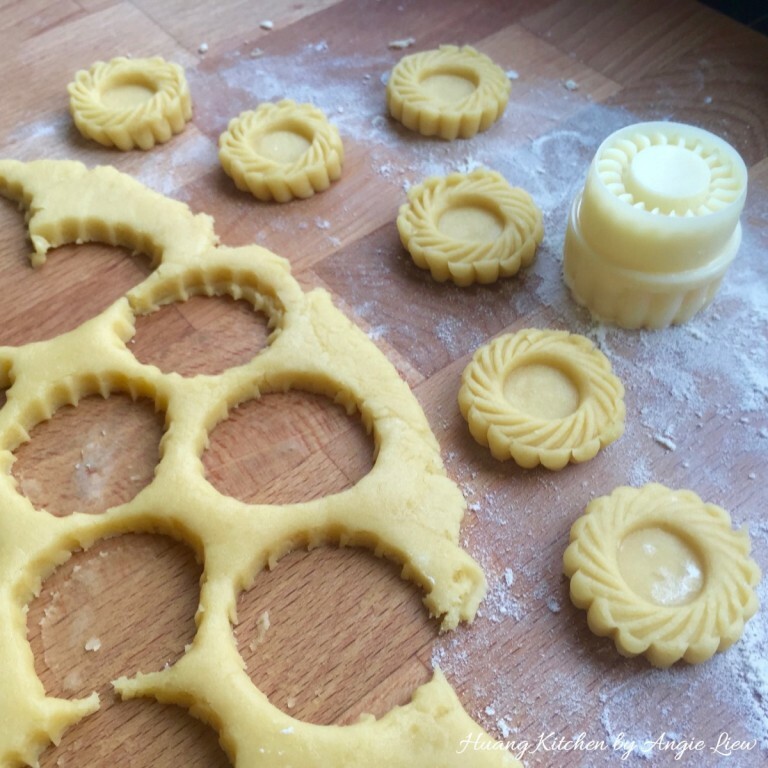 Using a pineapple tart mould, stamp into 3 cm rounds of tart shells. Press firmly on the dough and dislodge the tart shells carefully from mould. Arrange the stamped tart shells onto a baking tray. Brush the surface of the tart shells with egg wash.
Then preheat the oven to 175 degree C. You can start to preheat the oven about 15 minutes before you finish moulding. Otherwise just preheat after you are done with the moulding. Then baked the tart shells in the preheated oven for 10 minutes. 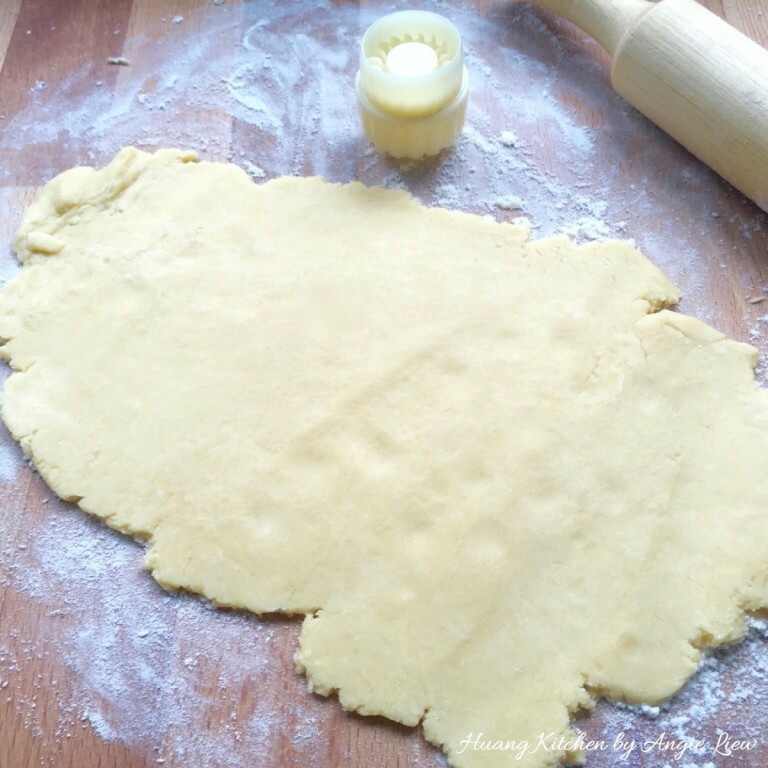 Meanwhile, gather the leftover pastry dough and roll to flatten it. 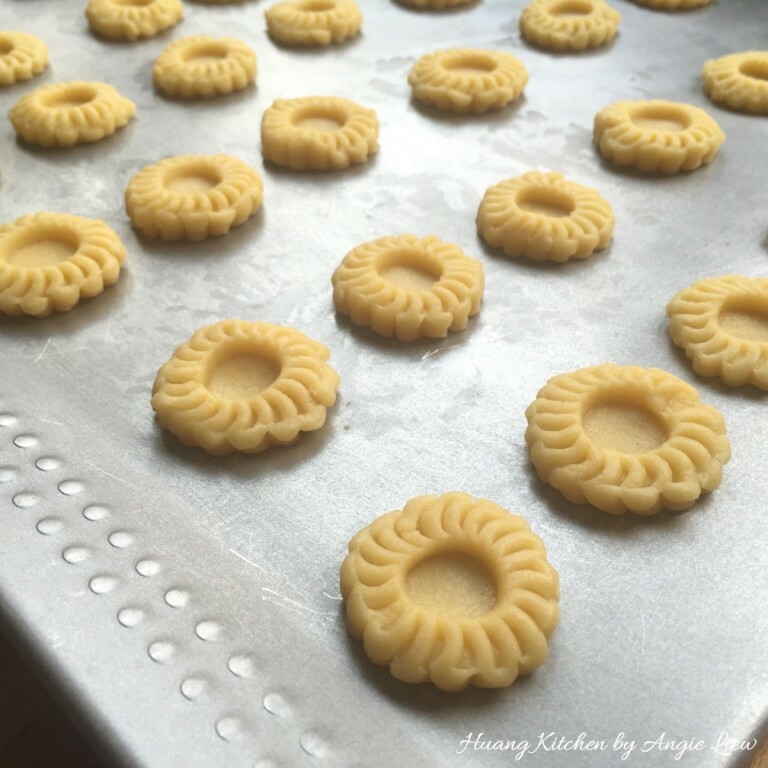 Using a fondant cutter, cut mini flower shapes to be put on top of the pineapple jam. Set aside for later use. 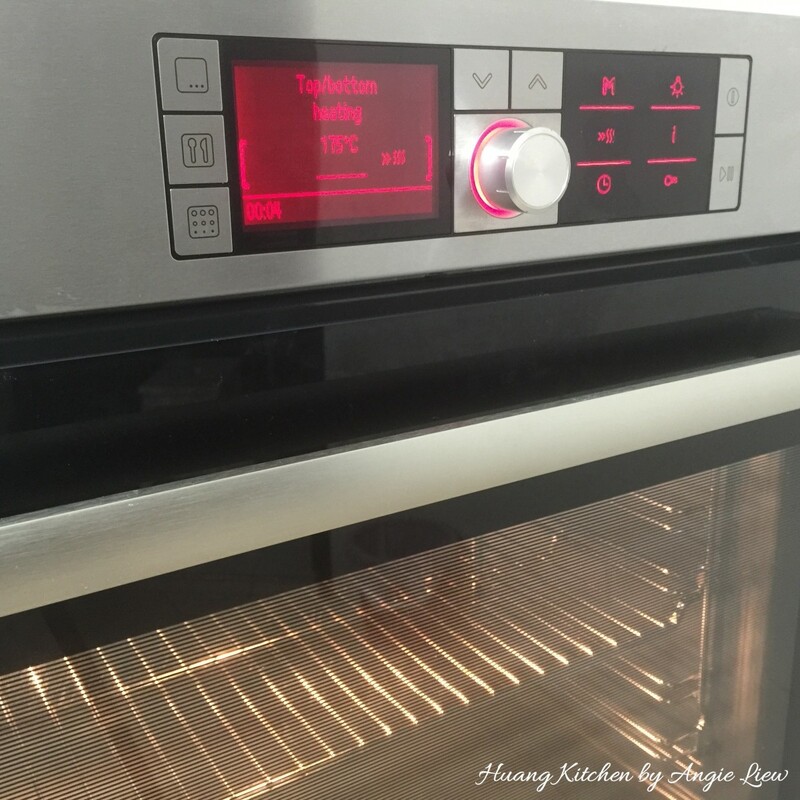 After 10 minutes, remove the partial baked tart shells from the oven onto a wire rack. Fill the centre of each tart shell with a rolled pineapple jam. Then top with the cut out mini flower shape pastry dough. Return the filled tart shells into the oven to bake for another 5 to 6 minutes, or until the tarts turn light golden in colour. And we're done! 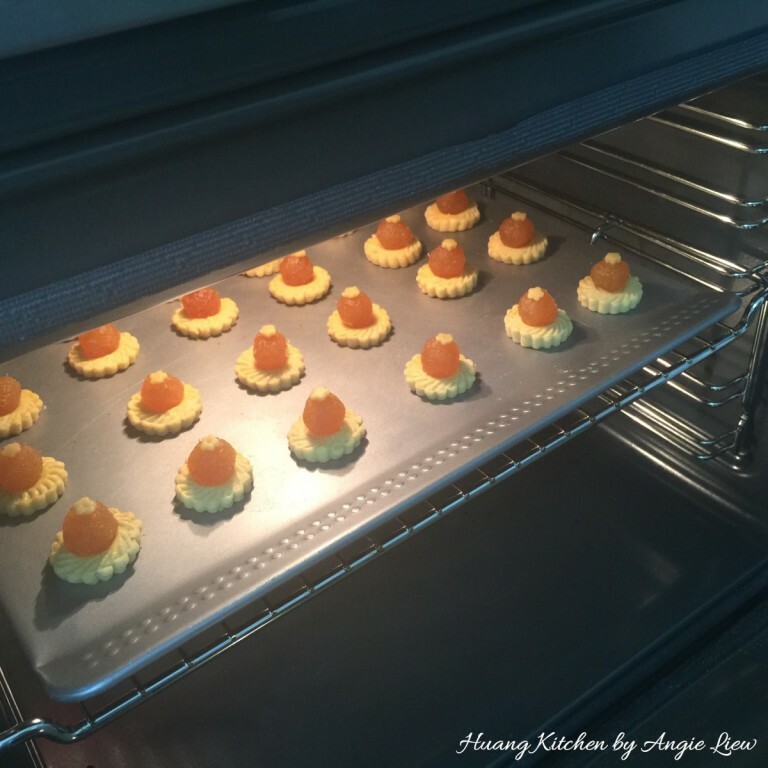 When baked, allow the pineapple tarts to cool on baking tray for about 5 minutes. Then transfer the baked pineapple tarts to a wire rack to cool completely. It is important to have the pineapple tarts to be completely cooled before storing in airtight container. 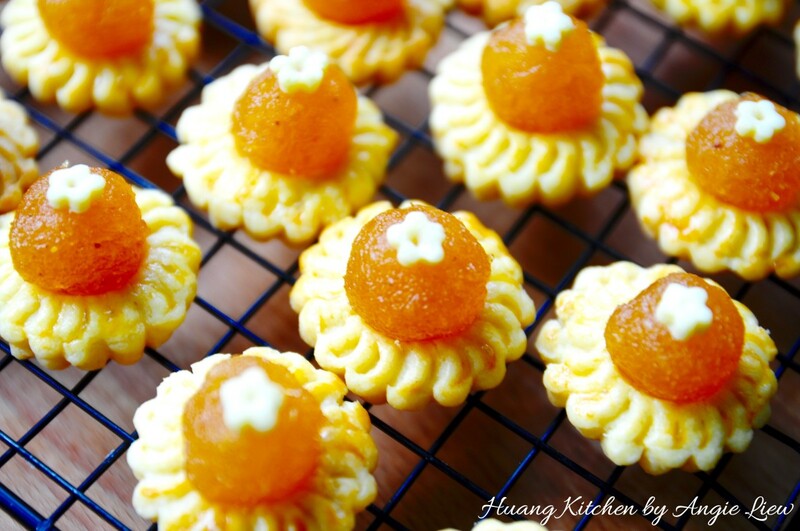 These dainty pineapple tarts are characteristically so buttery, crumbly and oh so melt-in-the-mouth! As always, ENJOY! Cold butter and ice water are the keys to a successful crust pastry for these tarts. 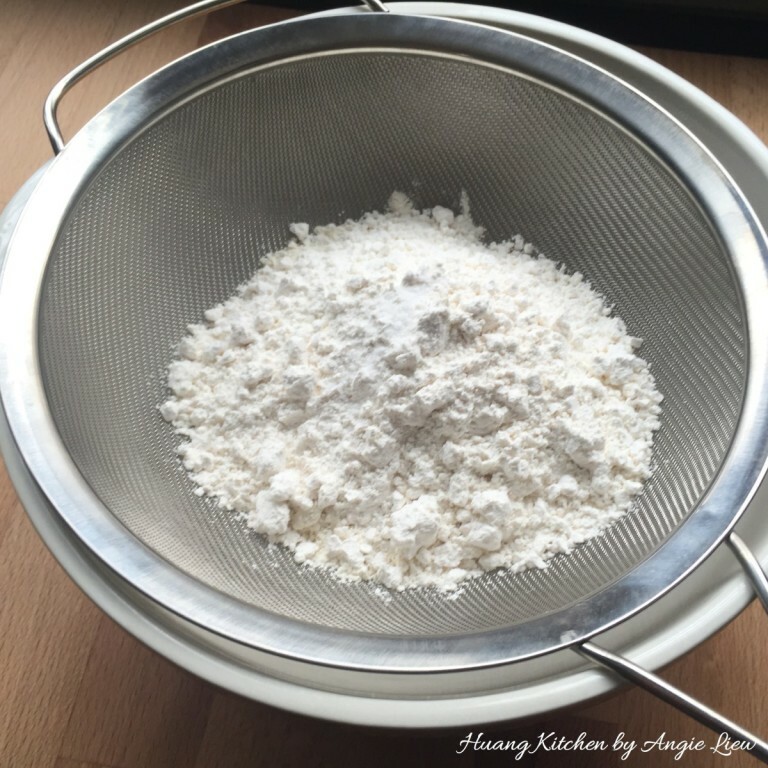 Light handling of the pastry dough is important so as to ensure the pastry to have the melt in the mouth effect. It pastry sticks to the mould cutter, lightly dust the cutter with flour so that the pastry can be released easily. 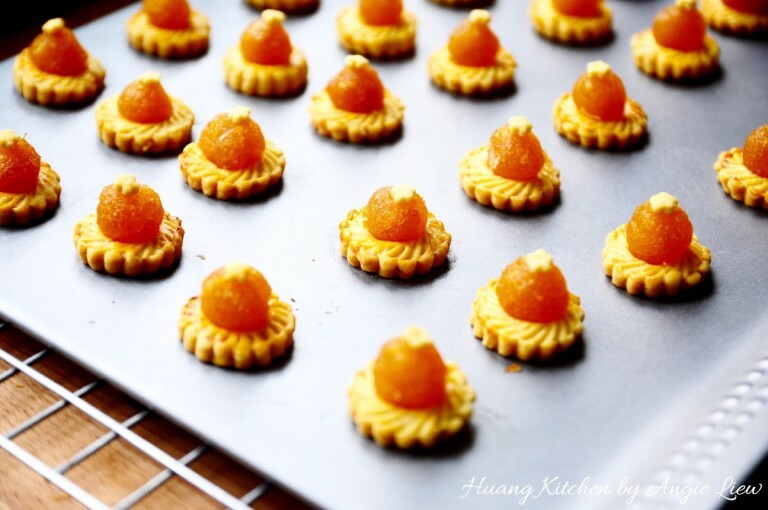 Pineapple tarts must be cooled completely before storing so that they will not turn mouldy easily. Do not cool pineapple tarts under the fan as this will soften the pastry.